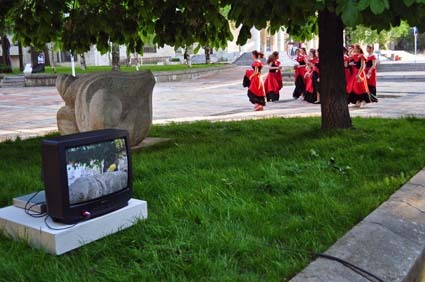 On Labor day between 17.00 and 19.00 p.m. Samuil Stoyanov made a performance in the park in front of the City Art gallery of Dobritch. 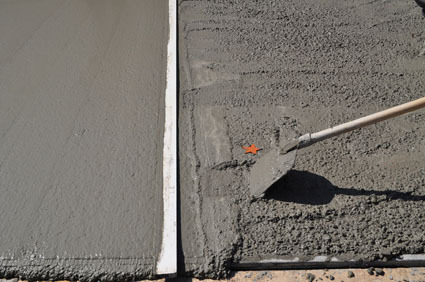 The date was selected internationally with the aim to focus on the meaning of the action. Although the Labor Day holy day is rather dedicated to the right of rest of the workers, the artist worked for two hours while demonstrating his position that art happens everywhere in the space between the art work and the audience. In his view, the viewer often needs to make an effort on his / her own in order to experience the "meeting". Part of the "material" for the performance is the carved stone sculpture in front of the city art gallery which is an interesting and contradictory object in itself. Neither the author, nor the title, nor the legal owner of this sculpture is known. All these murky circumstances and lack of specifics make of this sculpture a rather liberated artistic work while creating a perfect context for the realization of a new art work. 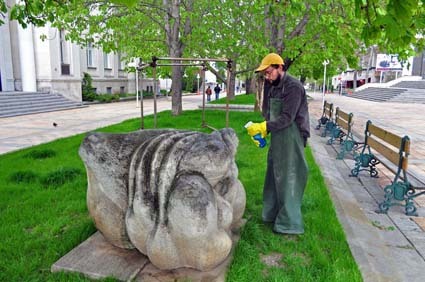 This action, which consisted of the artist cleaning up and thus re-activating the previously invisible art work for the space of the city, is part of the cycle of urban interventions which Samuil Stoyanov undertook in the framework of his participation in the international art project Art of Urban Intervention within the section organized by the Institute of Contemporary Art-Sofia. This action is dedicated to the artist's grandmother Efrosina Todorova Martinova. Action on poster stands, gold spray paint, stencils. Installation, 40 garbage bags, 40 fastening bands, street lamps; city of Dobritch. 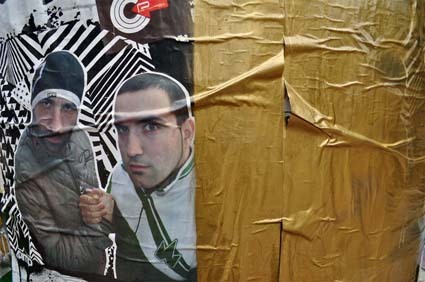 It is part of the cycle of urban interventions which Samuil Stoyanov undertook in the framework of his participation in the international art project The Art of Urban Intervention within the section organized by the Institute of Contemporary Art-Sofia. 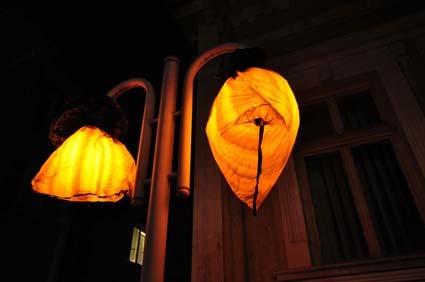 The main idea of the “Temporary Alteration” project is to create a short-term change in the public space of the city while concentrating on the ability of art to instigate change by the use of minimal means. This kind of change creates a different context which is urging the audience and the inhabitants of the city to consider a new view on the urban environment as well as a variety of intellectual and emotional interpretations. 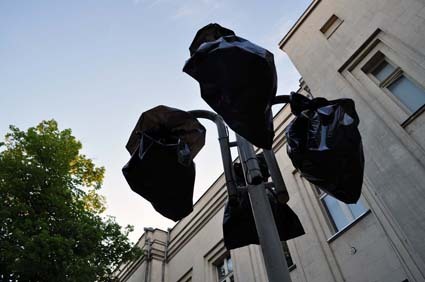 The project consists of slipping on (from bottom to top) black plastic garbage bags on to the globe-shaped street lamps on the square in front of the City Art Gallery of Dobritch. The bags are fastened at the top around the lamp post. Action, photographic documentation. 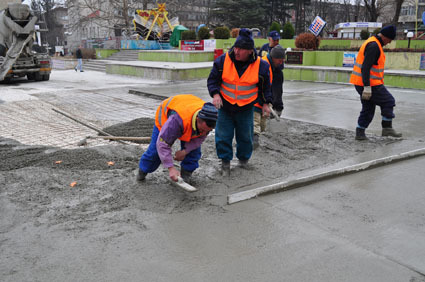 The red ceramic stars are pushed into the still soft concrete during the construction work on the new surface of the central square of the city of Dobritch.